I’m not going to take credit for the idea of Wraith but I will say that in 2006 before I moved out to Napa Valley, I was here for a work trip and had dinner at Press Restaurant with vintner Jayson Woodbridge, his assistant winemaker at the time and a few others. He brought with him Hundred Acre Kayli Morgan 2004 and Ancient Way Barossa Valley Shiraz 2004 for us to enjoy. As the evening progressed I couldn’t help but wonder what it would taste like to blend those two wines together coming from different continents but with the same winemaking team and so I poured a little of each wine into my glass to taste it blended together. I have to say it was pretty good and I remember as I looked up I saw Jayson looking at me with a little shock in his expression. When they first told me about Wraith, I immediately thought of that time together. 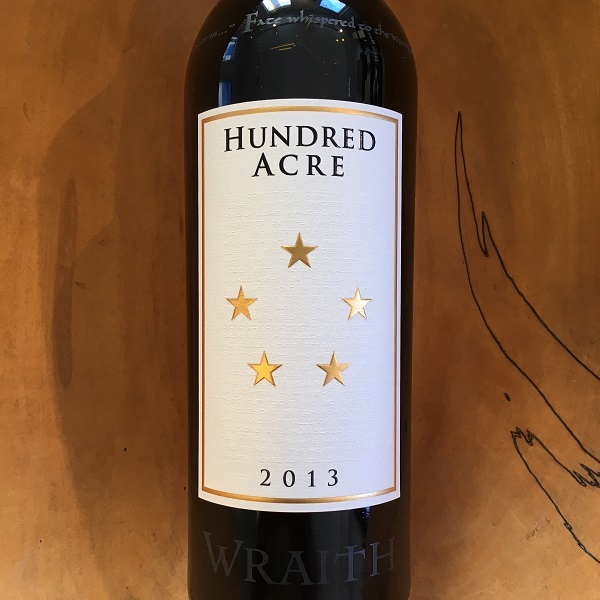 2013 is the first vintage release of Wraith, the culmination of blending select barrels from his three single vineyard Hundred Acre Cabernets – Kayli Morgan, Few & Far Between and Ark Vineyards. For the last ten years, vintner Jayson Woodbridge tried to create a blend from select barrels from Kayli Morgan and Ark Vineyards but he didn’t like how they turned out. It wasn’t until the 2013 vintage with the additional Few & Far Between that he completed a blend he thought was truly exceptional. I had the opportunity to taste this new release a few weeks ago and can easily say that it was the best wine showing in a great line-up of wines. It seems to take on the best characteristics of what each single vineyard provides. If you like Hundred Acre, I highly suggest you try Wraith.